This morning I shoved a nine-ton block of coral out of my way with just the slightest push of my pinky. 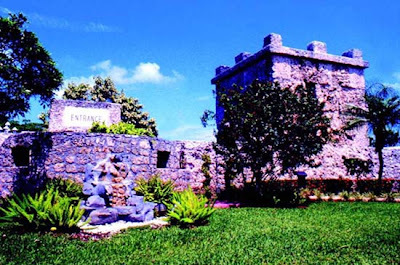 As much as I'd like to think my recent visit to the Fountain of Youth had some wonderful superhero-style effect, the credit actually has to go to eccentric genius Edward Leedskalnin, builder of the mysterious Coral Castle. 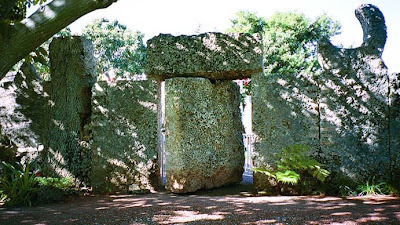 9 -Ton Gate Over Coral Castle. The massive coral slab door at the entrance to the castle is so perfectly engineered that it can be swung open with just a light, one-finger push. 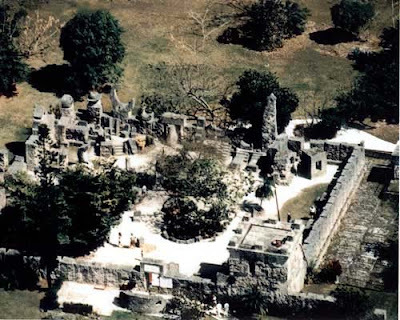 Aerial View of Coral Castle. The entire castle complex, which looks like a combination fortress and ancient temple, was constructed of huge coral blocks, many of which exceed five tons. Leedskalnin built the castle and everything in it by himself over 26 years -- using tools he made from scavenged junkyard parts. 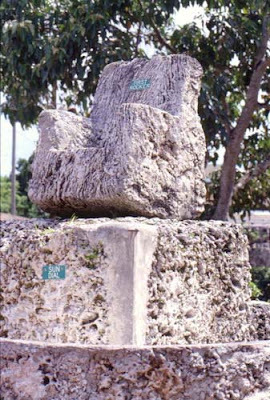 The Rocker In Coral Castle. Leedskalnin was no burly giant of a man. 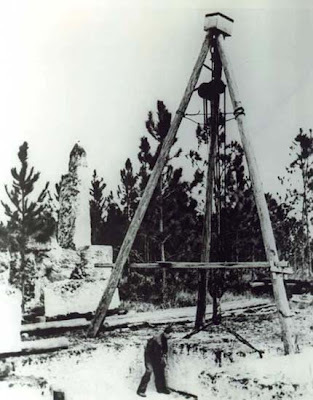 He stood 5 feet tall and weighed around 100 pounds, according to Coral Castle guide Ray Ramirez, who has spent the past two decades trying to figure out just how Leedskalnin managed to pull off this engineering feat. 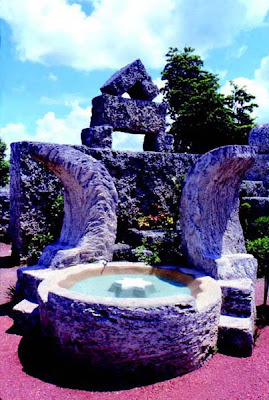 Amazing Moon Fountain In Coral Castle. There are many rumors but no concrete details on how Leedskalnin managed to build his bizarre and beautiful masterpiece. He worked only after the sun had gone down, refusing to allow anyone to ever see how he shaped, moved and placed the enormous blocks. 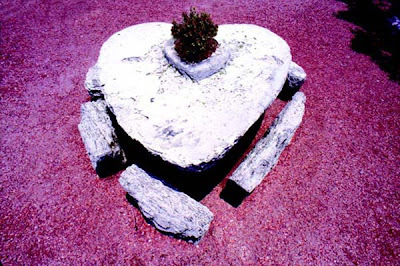 Artistic Heart Table In Coral Castle. Visitors to the castle are left to decide for themselves what motivated Leedskalnin. 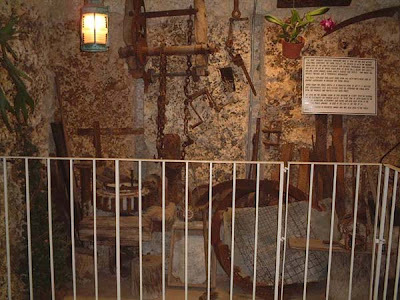 But it's easy to see that the items he created as a tribute to his "lost love" -- the beds, the heart-shaped table and the rocking chairs -- are far less carefully and lovingly crafted than the castle's shrines, occult and planetary symbols, and astronomical observatory. 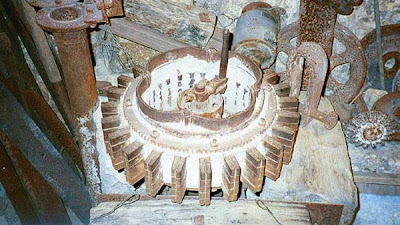 Ac-Generator In This Mysterious Coral Castle. Extreme Polaris Telescope Outside Coral Castle. Pride of place in the castle complex is given to a wonderful 30-ton lensless "telescope" that soars 25 feet above the castle walls. The telescope is perfectly aligned to the North Star, and on the first day of winter, sunlight pours directly through the scope's aperture, according to Ramirez. 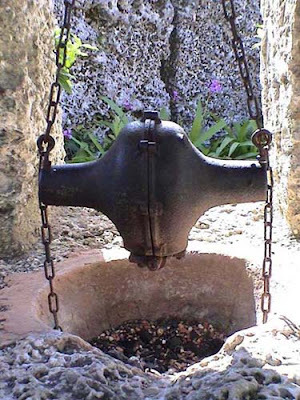 Huge Pressure Cooker In Coral Castle. Nice Tool Room Inside Coral Castle. Leedskalnin also crafted a sundial that tells the time within two minutes of accuracy. 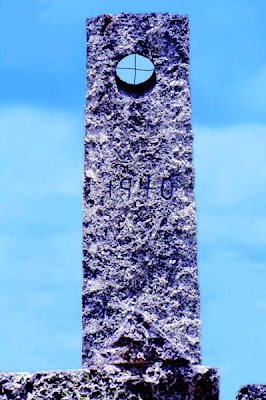 This solar clock stands directly across from a water pool carved from a huge slab of coral, with coral crescent moons on each side of the basin. The crescents represent the waxing and waning lunar cycles; the circular pool represents the full moon. Leedskalnin opened the castle to visitors after he completed it, charging a quarter for a tour if and when he was in the mood to socialize. 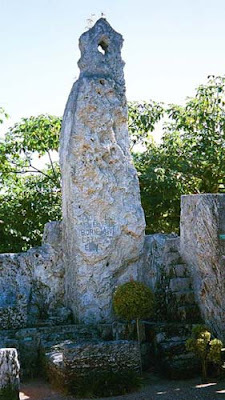 The Great Obelisk In Coral Castle. "People around here called him the 'little guy,'" recalled Ramirez. "The only time he ever asked for help was when he hauled the whole castle 10 miles up the road from Florida City in 1936." Ed Lifting Coral In Coral Castle. "Ed is a marvel and a mystery to me," said Ramirez. "But piece by piece I am putting together his puzzle. Someday I will know all his secrets."